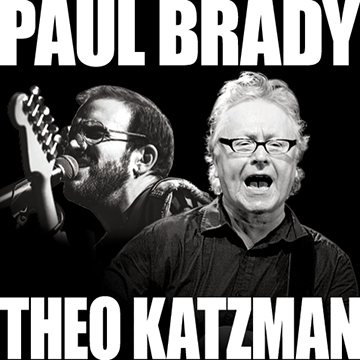 Coming this June will be one of the most exciting songwriting collaborations in recent history Irish living legend Paul Brady, and LA songwriter, producer and member of funk band Vulfpeck, Theo Katzman. Joining together on stage in a show featuring a collection of songs from both of these acclaimed songwriters, backed up by a specially chosen band from the U.S., Paul and Theo will sing and play together on songs from each of their extensive catalogues. A joining of musical genres and performance styles, that spotlight the global and ageless nature of music. “The first time I heard Paul Brady’s music, it was his first solo album Welcome Here Kind Stranger. I was completely floored, captured, and transfixed by his voice. It really hit me, and for years I couldn’t listen to that album without crying. I began digging through Paul’s entire catalogue, and he quickly became one of my favourite artists of all time. I felt such a strong connection to his voice, his songs, and his spirit, and I sensed that we were coming from a similar place, both musically and personally. As fate would have it, Paul and I ended up together at a mutual friend's house in Dublin in April 2018. Guitars came out, music ensued, and we ended up trading songs back and forth, late into the night. It really felt like a dream, but at the same time it made perfect sense. My intuitions about our musical connection proved to be true, and I was thrilled when Paul asked if I would like to collaborate on a run of gigs together. This tour is a very special engagement, and I couldn’t be more excited to be sharing the stage, sharing a band, and trading songs in concert with one of my musical heroes: Paul Brady." “I first saw Theo with his band in Whelan’s last year and was blown away. To hear so many great classy grown-up pop songs with such musicianship was a rarity. As a singer he could do anything with his voice from a soft emotion laden whisper to a scream that made me think of another hero of mine, Prince. The band was outrageously good and the quality and variety of Theo’s songs was inspirational to me. We luckily got to spend some time and play together at a friend’s house and the breadth of his talent as a songwriter became even more obvious. To my surprise, I discovered he had been familiar with my music for a long time. 2019 was a year I wanted to do something totally new. I thought about the possibility of us collaborating and, in spite of our obvious differences, geographical and generational, I decided to ask him how he’d feel about doing some shows together. What a thrill to discover that’s what he wanted too! I have never done anything like this before. With a band Theo will bring together, featuring Joe Dart (bass), Lee Pardini (keys) and Louis Cato (drums). I am gearing up to starting a whole new and exciting phase of my musical journey. "